Well, Now you can! Coffee project tells you all about how to do the roasting at home and even will sell you all the specialized equipment you want. 5 pounds of Costa Rican, Colombian or Guatemalan beans- also known as learning beans among roasters. A pair of oven mitts gloves. An outlet near the window on a separate circuit or has nothing plugged into the circuit. DO NOT use extension cords (we don't want the voltage to change when an appliance turns on such as a refrigerator or dyer while our machine is roasting). A brush or a towel for cleaning up chaff - paper like stuff that comes from the bean during roasting. One word about note taking, you will need to take notes if you expect to reproduce the same results. You want to take good notes on each batch you roast so you know you did it right. Name of country/region or other identifier. Process - wet, dry, or natural. Variables - such as weather (the numbers ie. humidity) time of day etc. Is this the first, second, Third roast of the day? is machine hot/cold. The Profile (length and temperature of each stage (if your machine tells you, some don't)). Anything that happens unusual during the roast. Load your machine as per its instructions, these vary per company and model. You can weigh your beans which is the standard way or you can measure them by volume, I prefer to weigh them, just how I learned to do it while working for Starbucks as a shift lead. Just be consistent remember you might want to duplicate later. Start your machine. Soon enough you will smell a warm hay field smell and a little bit of smoke. The beans will start to turn a khaki color. Start listening for a crack sound, there will be two of them. the first will be the water escaping from the beans. Write your notes the time, duration and temp. The second crack sound will be sometime after the first crack sound ends. You really need to listen for it because it is faint sounding like Rice Krispys. Now write down the time and temp. 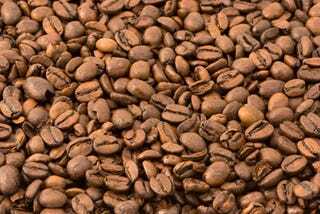 Now you will begin to notice a deeper roast smell, more smoke and some say the oils start to surface along with the beans growing a deeper color. And there you have it your frist batch of freshly roasted coffee ready to grind and serve. By the way this will probly be the best cup of coffee you'll have. To learn more see a much more lingther post at Roasting 101.